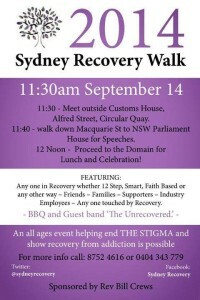 It’s great to know that the first Sydney Recovery Walk will take place this Sunday at 11.30 from Circular Quay. I’m thrilled, particularly given all the hard work of a special lady, walk organiser Jessica Khachan Moujalli, and the Rev Bill Crews. I’ve been communicating with Jessica for nearly a year now and it is really an honour to know her. She’s so humble about her achievements in finding recovery from great adversity, setting up the Sydney Recovery group and Facebook page, and looking after her family. Sadly, I cannot be there in Sydney, but I’m planning to link up with Jessica by Facetime whilst she is on the Recovery Walk and I walk here in Perth. I will be there in Spirit! Meanwhile, here’s a one hour radio programme from the ABC about recovery which involves Jess, Bill Crews and Ross Fitzgerald. 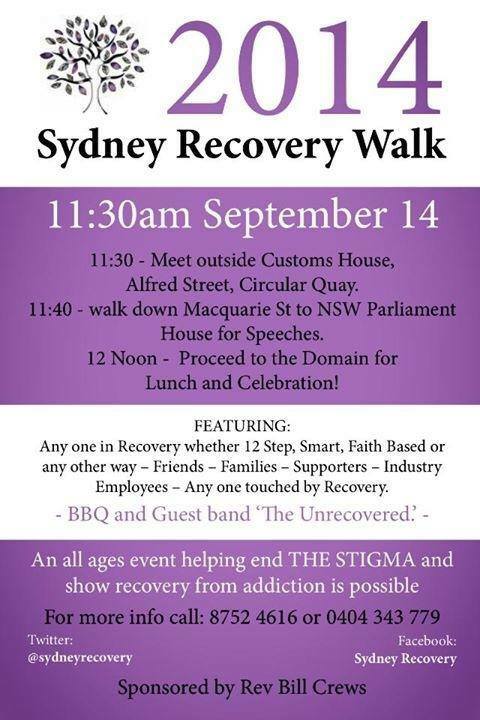 PLEASE attend the Walk, celebrate Recovery, and make some special new friends. My very best to you all.